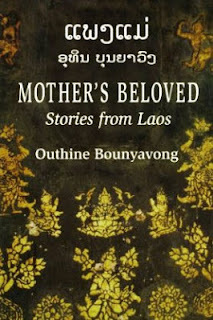 When I read the title of this book in Lao, I'd likely translate it as beloved/cherished mother because that's what paeng mae means in Lao. In any case, that's just a minor thing. I loved reading the introduction of this book that was written by Peter Koret. His intro discussing contemporary Lao literature was brief but very interesting to read. He's written other essays that have appeared in 2 other books on Laos as well. This book contains Mr. Outhine's short stories which are all fiction. The great thing about this book is that it's fully bilingual with Lao on one side and English on the other. So it makes for a great language learning tool as well. When this book was published in America, at the time it was one of the few Lao fiction story books out there. When I was in Laos I bought a few by other authors too. I was surprised there were even any fiction books available (though personally I prefer reading non-fiction). But the importance of this is that there's written creativity and expression that does exist even though by comparison to other countries, the Lao literary world is still small but definitely growing exponentially. This book is still available and reasonably priced. The person who turn this idea into reality is quite admirable. Awesome find! This is a wonderful project. We'll put up a separate post on this. Thanks ABCDLaos!